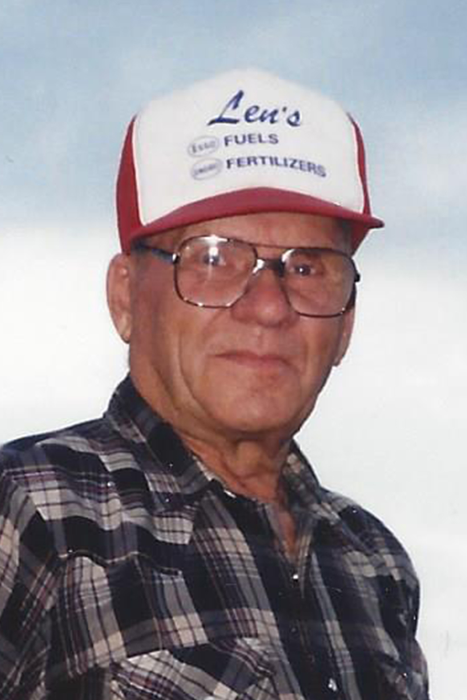 Obituary for Arthur "Uncle Joe" Henry Frey | Binkley's Funeral Service Ltd.
ARTHUR HENRY FREY (JOE) was born January 24, 1927 at the farm home of his parents, Fred & Helena Frey. He was the 5th child in a family of 6. He passed away November 24, 2018 at the Maple Creek Hospital (SIHF). He was 91 years and 10 months old. He is survived by one sister in law, Bella Frey; nine nieces and nephews and numerous great nieces and nephews. He was predeceased by his parents, Frederich & Helena Frey; brothers Edward, Alfred & Frederich Jr (Ernie); sisters Esther Bauer and Martha Gold; 3 nephews, one niece and one great nephew. Uncle Joe had a long and fruitful life. He worked hard, had a lot of fun and enjoyed good health for 90 years. He categorized his life in segments of 15. To put it simply, he said '15 years he went to school, 15 years he drank, 15 years he worked for Beaver Lumber, 15 years he worked the farm and then he was ready to retire. He was educated at Foch & North Ridge country schools. During the 15 years after school, when he was trying his wings, he worked at Bowie's Ranch and a few other local farms and ranches. He even ventured to Ontario once, considering being a lumberjack, but said he was on his way home in a week. He worked with Macleod store for awhile. He called this 'his necktie job'. In 1957 he settled in to working for Beaver Lumber for 15 years, and then in 1972 he went back to the homeplace and spent the next 15 years tending to crops and cattle. About 1987 he decided to retire. He sold his place to nephew Jerry Frey. At least every other day he would be out there checking that the crops and the calves were still growing. The big bonus was that now he had a little family of great nieces and nephew growing up in his midst. He moved into town, renting a unit in a 4 plex where he lived for almost 30 years. He moved over to Sunglow Court in 2017 when it was time to get away from stairs. Although moving was hard, he really enjoyed his new digs. There are lots of great stories about Uncle Joe from all the friends and relatives gathered here. It's a pleasure to relay a few favourites. His intelligence and sharp wit were evident from a very early age. Our mom told us this younger brother of hers, was always the prompter for plays at the country school, because he knew every kid's part just as well as his own. He knew the whole play, word for word, from beginning to end. He was not above causing a little aggravation either. He had issues with a neighbour girl who liked to shorten her walk home from school by cutting across the field. Uncle Joe would happily get some extra exercise running along the fence to make her walk all the way around the Frey pasture to get to her home. He was a teenage uncle to Doreen and Donny, and entertained them by showing off his trick riding skills. He had a horse he called Molotoff. He would tear through the yard going under the horses neck and up onto the horses back. He'd finish the show with Molotoff loping south and Uncle Joe gazing north as he rode by sitting backwards on the horse. When he was a much more mature uncle, he was still in the thick of things. Brother Jack had a pole vault apparatus set up in our yard, practicing for sports day. Along comes Uncle Joe and, of course he has to try this out. He picked up that long pole, ran out the gate and disappeared down the road behind the trees. Eventually he reappeared, well wound up and ready for a leap. We were all doubled over with laughter by that time, and thankfully, he ran out of wind before he made it to the pole vault bar. He was the brave one to tear across the dugout to see if the ice was thick enough for us to go skating and many hours of fun were had on the toboggan hill at gramma and grandpa's. He and his like minded brothers, even hauled water up the hill to make it icier and speedier. Uncle Joe once bought a nasty mare and according to temperament and speed, etc, he named her DYNAMITE. She surprised him with a colt, which he appropriately named Stick. He sold Stick to his great nephew Mike Shapley and out of this line came the famous bucking horse High Chapparrel. He entertained us with tall tales about the old farm house being so cold that when he got out of bed, he had to pry his feet off the floor with his egg flipper. You know the old Willie Nelson song that refers to 'all the girls I left behind'. Uncle Joe lamented the fact that he was too fussy about the gals he danced with in his younger days........some parts were too wide, a little too much this, and not enough that....and so... you ended up doing your own cooking. He loved card parties, dances, concerts, visiting around the neighbourhood and fooling around with all the kids in his life. In his retirement years, he enjoyed the local coffee shops, keeping track of prices at every cattle sale, and taking regular drives out to the country to check up on everything and everybody in his old stomping ground. Home Care girls kept an eye on him in the last couple of years, and although he complained about the cost, he admitted he sure would miss them if they didn't come. He also appreciated all the help he got from Molly Maid Nancy. He got to know people very quickly and grew a tremendous number of friends in his long life. Little does he know that memories of him will be entertaining us all for many, many years to come.